Pictures of the Gothic mural paintings of the church of St. Anthony the Abbott (chiesa San Antonio Abate), Pelugo, Italy. 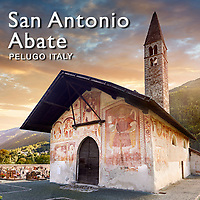 The charming small Gothic church of San Antonio Abate at Pelugo dates from the 9th century. The catholic church had a tradition of fresco paintings on their churches and cathedrals which were intended to be a “Biblia pauperum” or a poor mans Bible in pictures that would educate the illiterate masses of the era. The frescoes on the church of Pelugo were started in 1474 with the accomplished fresco of St. Anthony the Abbott above the main entrance, the painting being signed and dated. The fresco was painted by Cristoforo I Baschenis whose family were well known in the area as travelling painters. It is a schematic work with bright red and orange tones. St. Antonio is seated on a throne with his canonical pastoral symbols of a small bell and a piglet. Originating from Bergamo the Baschenises were responsible for paintings on many of the churches in their valley as well as the valleys of the western Trentino. After the first painting by Cristoforo Baschenis others were undertaken on the facade of the church by Antonio Baschenis, Dionisio Baschenis, Christoforo II Baschenis and Filipo I Baschenis. On the facade is a painting of the Madonna and child ( Madonna con il Bambino ) which is attributed to Antonio Baschenis. 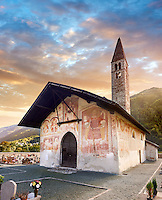 On the South wall of the church is a great cycle of paintings that traces the life of San Antonio Abate. There are 30 paintings of which the best preserved are those of the top register that have been protected by the wide eves of the building. These paintings are attributed to Dionisio Baschenis and were probably painted around 1493. The style of these paintings is simple and direct so as not to confuse the evangelical message that they were intended to impart. Download Pictures of the Gothic mural paintings of the church of St. Anthony the Abbott by the Baschenis family as stock photos or buy photo art prints on line.